Shazam! is the cinematic superhero version of Big (1988). A movie that takes a 14 year old boy, gives him the powers of Superman, and an adult body, is ripe for a cinematic interpretation. For the most part, director David F. Sandberg, and star Zachary Levi craft a perfectly pleasant and hilarious action adventure flick. The humor is sharp, witty, and relevant. There are several literal "laugh out loud" moments, and as soon as one joke ends, you wait for the next one. The laughs are the heartbeat of the film, and the humor is some of the best that the DC Universe has to offer. The biggest problem lies in the emotional journeys of the hero, Billy Batson, and the villain, Dr. Sivanna. The first 10 minutes or so of the film lay out the groundwork for Sivanna, and despite a wonderful performance from Mark Strong, it isn't enough to flesh him out completely. He seems a bit "mustache-twirly" and one dimensional at times. He wants to steal the power he was told he isn't worthy of, but by doing so, makes himself more and more unworthy. That lost, hurt little boy that you begin to connect with is long gone, and so is your sympathy for the character. The entire first act of the movie is predicated on Billy Batson's drive to find his mother. But that stops cold when he gets his powers. The movie shifts to his relationship with Freddy, and the new responsibility of using those powers. The mother thread - the driving force of the character - is quickly forgotten. The "Billy learning his super powers" sequence is one of the best parts of the film, but it comes at the price of forgetting all of the work done up until that point. Then the mother arc comes back in a way that feels forced and rush. It is almost like it was written in because it had to be. It is dealt with in a quick exposition scene, and then all of a sudden he's okay. Without spoiling it, Billy's reaction to that scene felt disingenuous. There was so much untapped potential there, with Billy's mother. His entire life - 11 out of his 14 years - were occupied with finding his mother. The resolution of that storyline that the film offers just doesn't land. The cast of kids are the highlight of the movie. It takes a bit for the film to gain momentum though. 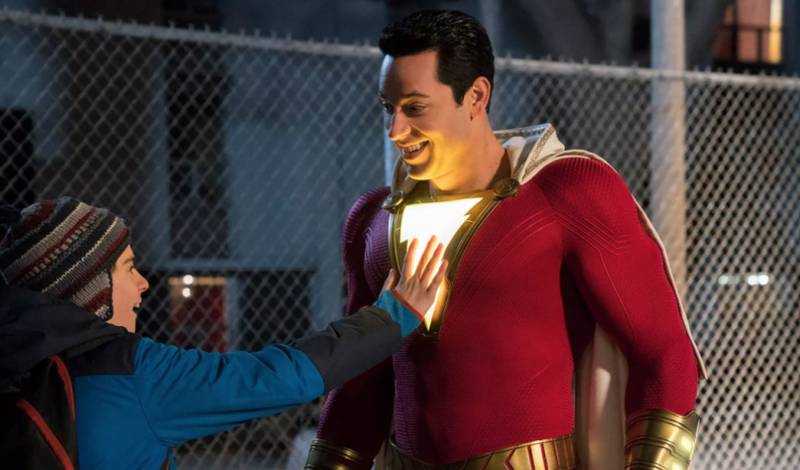 Once it stops relying on superhero references to get by, and starts leaning into to Billy's relationship with the other kids, and his sense of responsibility, Shazam! soars. Both Levi (grown up Billy) and Asher Angel (young Billy) are fun to watch on screen. You don't get bored of one and clamor to see the other, both are used in a way that makes you enjoy what you have and anticipate what is next. The other kids all carve out there own unique place in the movie too. While a couple of the characters lean into some unfortunate on-the-nose stereotypes, the chemistry between them is what makes them shine. Faithe Herman's Darla steals the show however. Her character will be a fan favorite. Another highlight is thanks to the film's setting. It is Christmastime throughout the story, in a way where you would think this is a Shane Black film. But the Christmastime setting allows for a certain character to have 2 or 3 absolutely hysterical moments. There are also a ton of fun surprises peppered in throughout the film, especially in the third act. Some of the surprises are (very entertaining) fan service, while others lay the groundwork for future sequels and potential spinoffs. All of it felt organic though, but perhaps that's because other aspects felt very forced. There is even an homage to Big, because the movie knows what it is, and does not shy away from it. The special effects are great, and for a movie made on a moderate budget, there are no complaints here. It looks really good. The aesthetic as a whole is pleasant, with the boyish charm of the flick bleeding into the overall look of it. For fans who want a fun, hilarious, heartfelt experience, Shazam! will be a crowd pleaser. But if you are looking for some deep emotional journey and payoff of groundwork laid out in a slow first act, you will be disappointed. Overall though, Shazam! is a ton of fun if you don't look at it too closely. I enjoyed it more than Aquaman which had too many glaring things for the positives of that movie to overcome. Still, both were better than what DC has been churning out post 2012, (with the exception of Wonder Woman), and they are definitely on an upward trajectory. Shazam! hits theaters April 5th.